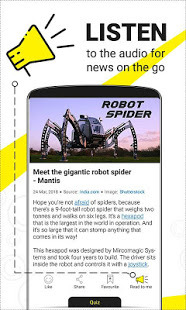 KidzByte, an Educational News App for children aged between 9 to 15 years old (grade 4 to grade 10), covers current affairs and world events with an innovative and kid-friendly approach. 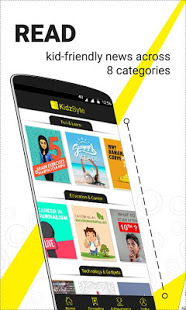 At KidzByte, we’ve combined media and technology to create a curated news platform exclusively for young readers to help them read on a daily basis and stay connected with the outside world. Some wisecrack humourously remarked that “NEWS” is the abbreviation of North-East-West-South. This is highly improbable; however, he or she has made a valid point. News is probably as old as civilisation itself. It encompasses the whole Universe and entire humanity. Hence, can we afford to exclude children from news and news-generating media? The answer is a no-brainer. Now, the relevant question that arises is what media is suitable for children. Take mainstream newspapers and magazines. Their language is not children-oriented and the medium – a vast sheet of paper – is not suitable for kids. Imagine a 9-year-old child hold one of those heavy magazines or turn those “extra-large” pages of a newspaper. Very difficult to imagine, isn’t it? This left us pondering. How do we transmit news to children? Our ruminations led to the culmination of KidzByte, an exclusive news app that revolves around daily happenings in the world we live in. Being a unique combination of media and technology, KidzByte empowers children to become tomorrow’s responsible human beings. Needless to say, this revolutionary app will lead to a learning experience that is efficient and smart. Moreover, it ignites a spark in their beautiful minds, leading to a full-fledged conflagration in the form of home discussions and classroom debates. Therefore, one thing is certain: children will be well-informed, well-aware, and most importantly will develop a mind of their own. What makes KidzByte App Special? B - Bored of reading? Try the audio! 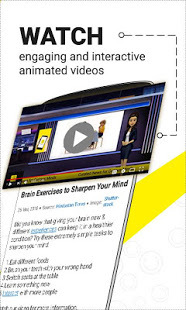 KidzByte engages the interest of the reader through tailor-made articles, written by professional content writers. 360° all-round development is ensured because we cover everything from science and technology, to fashion and sport. Apart from articles which help to improve the reading fluency we have quiz to enhance your child's general knowledge skills. Getting information across to children is difficult without forging the right connection. KidzByte, a free educational app for children ensures that there is plenty of “connect” through quizzes and discussion topics. Being well-informed through this entertaining and engaging educational app, children derive the inspiration to transform themselves & their future. Therefore, they are better equipped to face the challenges that life throws at them in the long run.